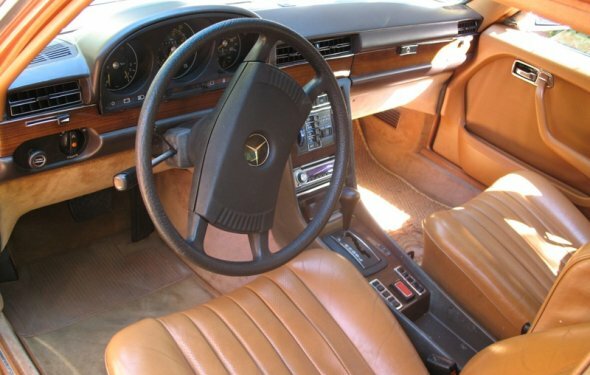 When I found a 1980 Mercedes-Benz 300SD listed on the Internet for $2000, I had visions of cruising in serene comfort all the way to L.A. The seller lived near Buffalo, New York, and assured me all the Benz needed was a battery and it'd be ready to make the drive. I offered $1400, he accepted, and I sent one of C/D's road warriors with a truck and trailer to retrieve it. The staff thought my plight was hilarious. I got a small bit of revenge when, after too many hours to count, I got the Benz to run. The culprits turned out to be rusted battery wiring and a busted starter post. The brake rotors and calipers were so rusted, though, that the Benz needed a frightening 384 feet to stop from 70 mph, about twice the distance required by a modern car. With only $100 left in the kitty, I pleaded with a Mercedes parts house called Adsit Company ( 800-521-7656: buy something, dear readers, anything) to provide parts gratis for our scientific expedition. Adsit responded with front-brake rotors, pads, and rear shocks that quelled a bad rear vibration at 80 mph. Then I made a very smart move for a guy from Jersey. I recruited brothers Russ and Dave Ferguson as teammates. Russ, 47, is a master mechanic and auto instructor at Washtenaw Community College in Ann Arbor. An architect by day, Dave, 54, put himself through college fixing Volvos. These are energetic guys who can fix anything. Five hours after I called them, they had concocted four routes, with mileages plotted to the 10th and every stop meticulously mapped out. Quiroga dubbed them the "Dream Team." The Saturday-morning start was a joke. We left at 9:23 a.m., minutes after the Olds had bolted. Although the Benz took 18.1 seconds to get to 60 mph, it was soon cruising at 80 mph. At 9:45 we passed Quiroga for the lead and pulled away. Our clunker Benz was showing its autobahn breeding. At 85 mph, the engine was screaming, revving at about 500 rpm short of the 4350-rpm redline—perfect, I thought, for a quick meltdown. But three hours later we passed Chicago. Sigh. Snow was predicted in Denver, so we headed south on Interstate 55. The first eight hours were uneventful. We averaged 70 mph, including two 10-minute stops. Via cell phone, the teams were waging disinformation campaigns to throw one another off. After passing through St. Louis, I called Quiroga—he was on the same route—to warn him of a nonexistent traffic jam and advised a longer, alternate route. His reply was so sweet and genuine it almost made me feel guilty: "Aw, hey, man, thanks a lot." We guessed we had a 60-mile lead. A couple hours later we stopped in Dixon, Missouri, to gas up. There was a Shoney's conjoined with the gas station, and we grabbed some napkins—for 50 points! Later, we would mistakenly use them to clean up some ketchup, forget their worth, and toss them out. The junker Benz continued its 80-mph pace until we ran into an ice storm early Sunday morning in eastern New Mexico. The roads looked wet, not icy, and the Benz's novocaine steering gave no hint of the danger. We got a huge wake-up call when the Benz, which is so underpowered it never hurts for rear-wheel traction, spun its rear tires as we pulled off an exit ramp for a quick break. We were about 30 miles east of Flagstaff, Arizona, with no town big enough in between that might offer help. We limped into Flagstaff, found a parts store, and the Dream Team went into action. Even though I had replaced the Benz's two fuel filters before the start, Russ figured one of them was clogged. Miraculously, the store had one of the two in stock. Russ installed it—fixing the problem—and we headed south to Phoenix. Getting on the horn, we found that Quiroga was still behind, but road warrior Jared Gall in the Datsun said they were about 150 miles north of Vegas. That meant their ETA was about the same as ours, which sent us into panic mode. Since we had rejected the scavenger-hunt rules, our only chance to save face was to get to Redondo Beach first, or so we thought.